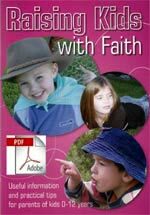 Please note: This is the PDF download edition of Raising Kids with Faith which can be viewed on most computers and mobile devices. What parent doesn't have a desire for their child to experience spiritual wellbeing, belief in God, hope, peace, purpose and a future beyond this life, which gives meaning to life now? The ideas in this book are from Australian parents who have proved that it is possible to nurture a child's developing spirituality in the course of busy, everyday family life.